﻿ Best Price on Deja Resort All Inclusive in Montego Bay + Reviews! Deja Resort is located on the Hip Strip,” next to Doctors Cave Beach. It features 2 on-site restaurants and an outdoor pool and hot tub. A flat-screen TV is included in every room at the Deja Resort. Decorated in bright blue and teal, some of the rooms have a private balcony with a view. The Waterfall Restaurant and the Deja Bar and Restaurant serve international and local cuisine and are open for breakfast, lunch, and dinner. Guests can work out in the fitness center or enjoy a game of table tennis or billiards at the Deja Resort. The hotel also offers a tour desk, currency exchange, and car rental. Aqua Sol Theme Park is just 0.6 mi from the hotel. 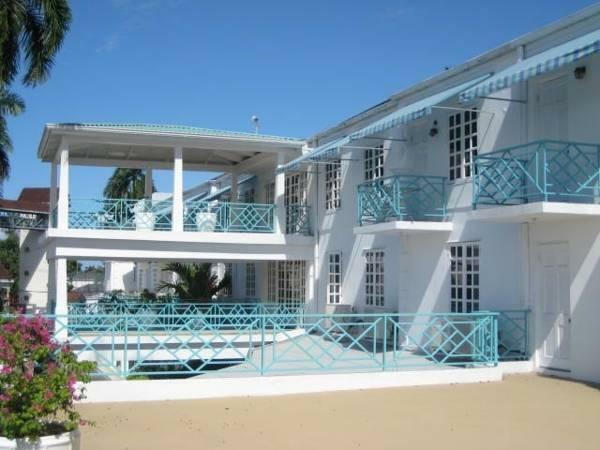 Sangster International Airport is less than 5 minutes’ drive away. Please note that guests will receive a wrist band that should be worn until departure, upon check-in. Upon check-in photo identification and credit card is required. All special requests are subject to availability upon check-in. Special requests cannot be guaranteed and may incur additional charges. Children under the age of 4 stay free. The staff was really nice, the complimentary breakfast was good, and the room service was timely. The hotel made me feel like the owners/operators reviewed a check list of standard features of other nicer hotels, check the required items off, but only with a halfhearted effort. The obligatory WIFI did not reach my room, which doesn't matter so much, because it was really slow anyway. There are public free use computers, but the chairs are really uncomfortable and the audio is the administratively locked out. The onsite gym was so small that it couldn't possibly fit more than 4 people at a time, though the equipment seemed new. The rooms don't come with a plunger, though the plumbing had issues in my rooms and in the public restrooms (yes, I tried them all). The cable didn't work in my room and there was way too few electrical sockets to plug many things in effectively. I had to unplug a few things that came with the room. All these bad things said, the staff was the best part here. They were very nice and did there best to aid me in all my endeavors. They speak standard American English for us foreigners and my needs were met by the staff. It's just all the other issues I mentioned before. It just feels like a possibly higher class hotel opportunity wasted through poor resource utilization. Overall, it's still an okay place. However, that is all it will ever be. Just OK. Not exactly a hidden gem.